On their third release, Spacecraft delivers more of their brand of cosmic atmospheric electronica. The core trio of Tony Gerber on guitars and synthesizers, John Rose on synthesizers, and Diane Timmons on synthesizers and vocals, is joined by Giles Reaves on synthesizers. Spacecraft's strength continues to be their ability to create floating space tapestries that, while being relaxing, are well beyond simple New Age. The experience is active in that rather than being lulled into a meditative trance I find myself focusing on the imagery the music conjures up in my mind. As with previous releases, the sensation is one of actually being in space, both in sound and surroundings. Little of the eerie atmospheres I detected on Hummel are present here, the feeling consistently being uplifting and optimistic. That's not to say the music is drastically different than before because it's not. That's just the impression I get from Earthtime Tapestry, and impressions and feelings are very much a part of the Spacecraft experience. 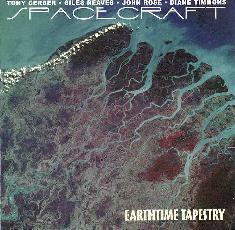 Tracks like "Beyond" and "Thread Of Continuity" that include Diane Timmons' space chants are among my favorites. These songs sound like they were recorded in some astral cathedral with a lead angel stepping up to the mic. The songs are also shorter on this release with none breaking the ten minute mark. But it's a minor point as the songs flow so well from one to the next that it can easily be experienced as one large work. Recommended to fans of atmospheric electronica. You can also hear sound files at their mp3.com web site.